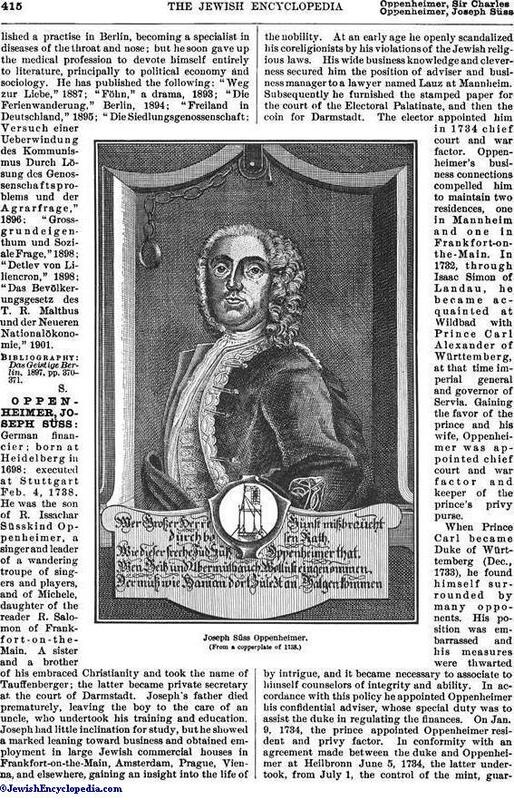 German financier; born at Heidelberg in 1698; executed at Stuttgart Feb. 4, 1738. He was the son of R. Issachar Süsskind Oppenheimer, a singer and leader of a wandering troupe of singers and players, and of Michele, daughter of the reader R. Salomon of Frankfort-on-the-Main. A sister and a brother of his embraced Christianity and took the name of Tauffenberger; the latter became private secretary at the court of Darmstadt. Joseph's father died prematurely, leaving the boy to the care of an uncle, who undertook his training and education. 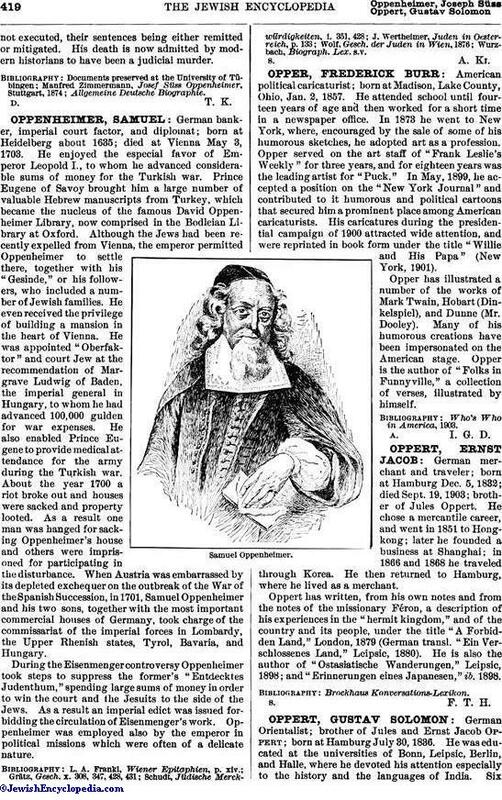 Joseph had little inclination for study, but he showed a marked leaning toward business and obtained employment in large Jewish commercial houses in Frankfort-on-the-Main, Amsterdam, Prague, Vienna, and elsewhere, gaining an insight into the life of the nobility. At an early age he openly scandalized his coreligionists by his violations of the Jewish religious laws. His wide business knowledge and cleverness secured him the position of adviser and business manager to a lawyer named Lauz at Mannheim. Subsequently he furnished the stamped paper for the court of the Electoral Palatinate, and then the coin for Darmstadt. The elector appointed him in 1734 chief court and war factor. Oppenheimer's business connections compelled him to maintain two residences, one in Mannheim and one in Frankfort-on-the-Main. In 1732, through Isaac Simon of Landau, he became acquainted at Wildbad with Prince Carl Alexander of Württemberg, at that time imperial general and governor of Servia. Gaining the favor of the prince and his wife, Oppenheimer was appointed chief court and war factor and keeper of the prince's privy purse. 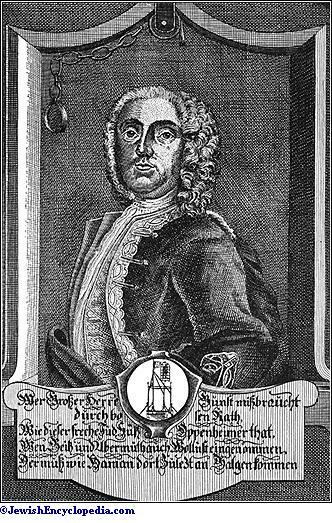 When Prince Carl became Duke of Württemberg (Dec., 1733), he found himself surrounded by many opponents. His position was embarrassed and his measures were thwarted by intrigue, and it became necessary to associate to himself counselors of integrity and ability. In accordance with this policy he appointed Oppenheimer his confidential adviser, whose special duty was to assist the duke in regulating the finances. On Jan. 9, 1734, the prince appointed Oppenheimer resident and privy factor. In conformity with an agreement made between the duke and Oppenheimer at Heilbronn June 5, 1734, the latter undertook, from July 1, the control of the mint, guaranteeingto the duke a largely increased revenue. Oppenheimer's management yielded unexpected profits, and the duke's confidence in him increased; while the opponents of the prince looked on with evil eyes as Oppenheimer's skill enriched the duke and conducted to successful issues the various private financial enterprises entrusted to his management by his master. In 1735 a new source of income was provided for the duke through a monopoly of the printing of playing-cards, granted to Moses Drach and his company for a stated yearly sum. Oppenheimer had obtained for Jews contracts for supplies for the army on the Rhine. In consequence the enmity toward the Jews increased in the country, and plans were laid to bring about Oppenheimer's disgrace. Complaints were brought against his management of the mint. These complaints were reenforced by the fact that the duke was not at the time reaping the profits he expected, though this was due only to the many improvements Oppenheimer had been obliged to make as well as to various untoward circumstances for which Oppenheimer was not responsible. After much discussion a new agreement was made in regard to the mint (Oct., 1735), not less advantageous for the purse of the duke than the former agreement. Yet the difficulties in connection with the mint inevitably increased, there being at that time a monetary crisis throughout Germany. In Württemberg, Oppenheimer was accused of having minted coin below the standard and in quantities larger than those authorized, thus enriching himself and the duke. Oppenheimer therefore requested the duke to make a thorough examination and accounting (Feb. 15, 1736) and asked to be relieved of the charge of the mint. After obtaining the opinions of experts the duke publicly proclaimed (March 20, 1736) that Oppenheimer had not caused the crisis at the mint. The counselors Boesenius and Hallwachs undertook the accounting and kept it dragging on until Oppenheimer again insisted on being released and declared his intention of leaving the country and the duke's service. 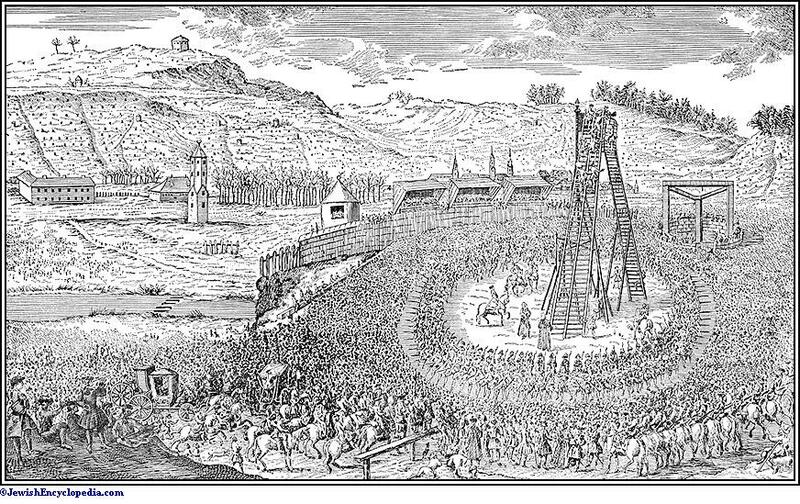 Execution of Joseph Süss Oppenheimer. The duke now gave signal evidence of his confidence in Oppenheimer by appointing him privy councilor of finance. In his new dignity Oppenheimer succeeded in settling a large number of Jewish families at Ludwigsburg, in spite of the strong objections of the states, to which the duke paid no attention, and regardless of the law prohibiting Jews from settling in the country. The continual monetary difficulties of the duke, his desire to be financially independent of the states, and the military plans he had in view compelled him to seek ever new sources of revenue, and in this he needed Oppenheimer's advice. By the decree of Dec. 22, 1736, a "tutelary council" was appointed whose duty it was to keep a record of marriage dowries and supervise the division of property in case of death, certain taxes being imposed in these cases. It was also the duty of this council to determine where and how this decree was violated and to impose the necessary fines. By this decree a kind of supervision was instituted over the property of every person of means, which caused a great deal of discontent. Loud complaints arose of the injustice of the tutelary commissioners, who accepted bribes and oppressed those who would not bribe them. 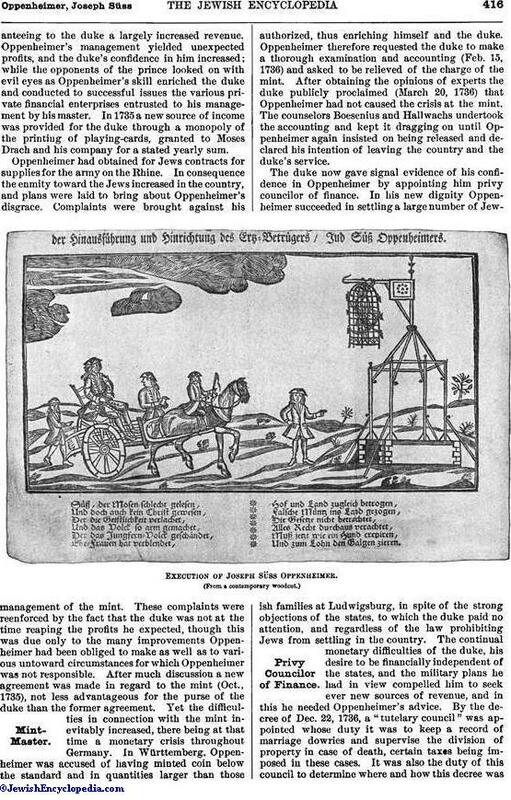 In the same year, 1736, the duke issued another regulation which greatly excited the people of the country and which was laid at the door of Oppenheimer. This was the institution of commissions to examine into the conduct of certain officials, to fine them or remove them from office, to appoint new incumbents, and to redistribute such positions. These commissions became a menace; they led to blackmail and bribery. Some bribed the commissioners in order to be retained in office; others, to be appointed; others, to escape punishment or disgrace. A "Gratialamt" was established, where applications for positions were received; and the duke had permitted Oppenheimer to accept considerations from the applicants, he and his master dividing such receipts between them. The sums collected by these devices had become so large toward the end of 1736 that the officials and the people, the Church and the aristocracy, the landowners and the merchants—in short, all who possessed or earned money—became more and more incensed at the proceedings of the tutelary council, the commissions, and the "Gratialamt," and every wrong was ascribed to the evil advice of Oppenheimer. The general bitterness was intensified when the duke decreed (Jan. 13, 1737) that the export and import of tanned leather and of hides should be supervised—that a board of supervisors should impose certain duties and collect heavy fines in cases of violation of the law. 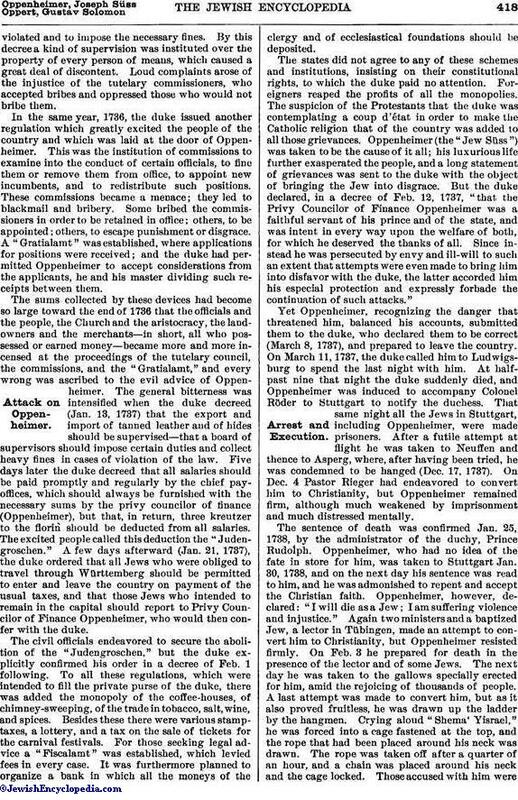 Five days later the duke decreed that all salaries should be paid promptly and regularly by the chief pay-offices, which should always be furnished with the necessary sums by the privy councilor of finance (Oppenheimer), but that, in return, three kreutzer to the florin should be deducted from all salaries. The excited people called this deduction the "Judengroschen." A few days afterward (Jan. 21, 1737), the duke ordered that all Jews who were obliged to travel through Württemberg should be permitted to enter and leave the country on payment of the usual taxes, and that those Jews who intended to remain in the capital should report to Privy Councilor of Finance Oppenheimer, who would then confer with the duke. The civil officials endeavored to secure the abolition of the "Judengroschen," but the duke explicitly confirmed his order in a decree of Feb. 1 following. To all these regulations, which were intended to fill the private purse of the duke, there was added the monopoly of the coffee-houses, of chimney-sweeping, of the trade in tobacco, salt, wine, and spices. Besides these there were various stamp-taxes, a lottery, and a tax on the sale of tickets for the carnival festivals. For those seeking legal advice a "Fiscalamt" was established, which levied fees in every case. It was furthermore planned to organize a bank in which all the moneys of the clergy and of ecclesiastical foundations should be deposited. The states did not agree to any of these schemes and institutions, insisting on their constitutional rights, to which the duke paid no attention. Foreigners reaped the profits of all the monopolies. The suspicion of the Protestants that the duke was contemplating a coup d'état in order to make the Catholic religion that of the country was added to all those grievances. Oppenheimer (the "Jew Süss") was taken to be the cause of it all; his luxurious life further exasperated the people, and a long statement of grievances was sent to the duke with the object of bringing the Jew into disgrace. But the duke declared, in a decree of Feb. 12, 1737, "that the Privy Councilor of Finance Oppenheimer was a faithful servant of his prince and of the state, and was intent in every way upon the welfare of both, for which he deserved the thanks of all. Since instead he was persecuted by envy and ill-will to such an extent that attempts were even made to bring him into disfavor with the duke, the latter accorded him his especial protection and expressly forbade the continuation of such attacks." Yet Oppenheimer, recognizing the danger that threatened him, balanced his accounts, submitted them to the duke, who declared them to be correct (March 8, 1737), and prepared to leave the country. On March 11, 1737, the duke called him to Ludwigsburg to spend the last night with him. At half-past nine that night the duke suddenly died, and Oppenheimer was induced to accompany Colonel Röder to Stuttgart to notify the duchess. That same night all the Jews in Stuttgart, including Oppenheimer, were made prisoners. 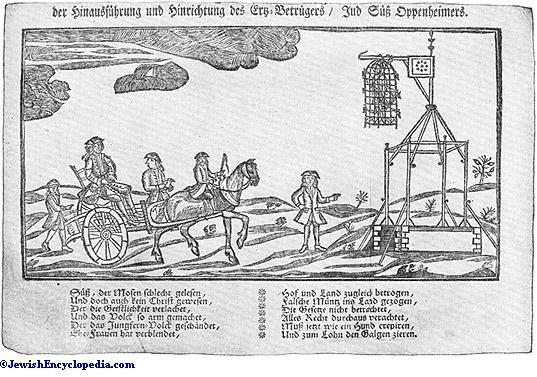 After a futile attempt at flight he was taken to Neuffen and thence to Asperg, where, after having been tried, he was condemned to be hanged (Dec. 17, 1737). On Dec. 4 Pastor Rieger had endeavored to convert him to Christianity, but Oppenheimer remained firm, although much weakened by imprisonment and much distressed mentally. The sentence of death was confirmed Jan. 25, 1738, by the administrator of the duchy, Prince Rudolph. Oppenheimer, who had no idea of the fate in store for him, was taken to Stuttgart Jan. 30, 1738, and on the next day his sentence was read to him, and he was admonished to repent and accept the Christian faith. Oppenheimer, however, declared: "I will die as a Jew; I am suffering violence and injustice." Again two ministers and a baptized Jew, a lector in Tübingen, made an attempt to convert him to Christianity, but Oppenheimer resisted firmly. On Feb. 3 he prepared for death in the presence of the lector and of some Jews. The next day he was taken to the gallows specially erected for him, amid the rejoicing of thousands of people. 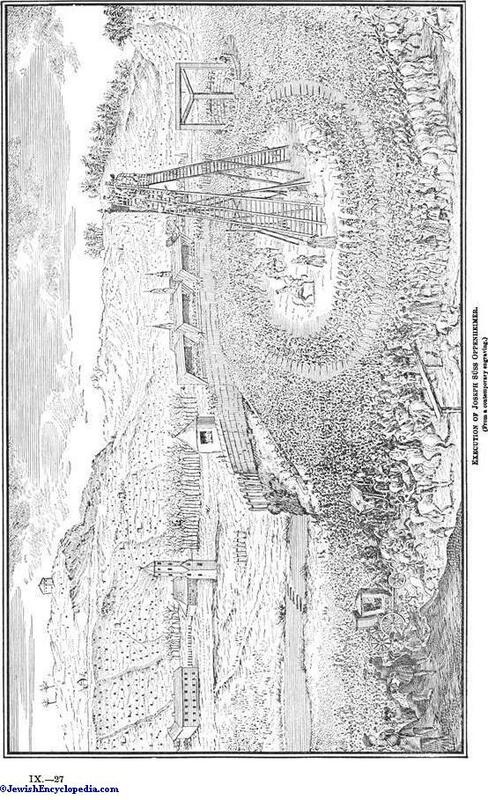 A last attempt was made to convert him, but as it also proved fruitless, he was drawn up the ladder by the hangmen. Crying aloud "Shema' Yisrael," he was forced into a cage fastened at the top, and the rope that had been placed around his neck was drawn. The rope was taken off after a quarter of an hour, and a chain was placed around his neck and the cage locked. Those accused with him werenot executed, their sentences being either remitted or mitigated. His death is now admitted by modern historians to have been a judicial murder.